Which water technology will save California from its long, dry death? The western United States exists in a state of willful ignorance about water. Waking up won't be easy, and it will be expensive. Solar receivers at the WaterFX demonstration plant in the Panoche Water and Drainage District in California. Water is complicated—especially in the West. For years, willful ignorance has prevailed. Infrastructure projects allowed water to flow in places it would not otherwise be found. Seemingly plentiful supplies allowed agriculture to flourish. California raced to become a top producer of fruits, vegetables, nuts, and wine. Water gushed from the taps, kept cheap by the sheer political willpower invested in sustaining a blissful mirage of water abundance. A drought in the late 1980’s solidified water conservation habits for many in the state. Over time, though, we forgot these difficulties, because it’s easier to exist in the belief that our water will always be there when we need it. So when history repeated itself, the California of 2014 was surprised to find serious water problem on its hands. Suddenly, it was gone. Wells went dry. People began stealing water. Extreme drought conditions, dwindling water reserves, and shrinking aquifers all influenced the decision from California’s Governor Brown to further limit water use by everyone. The mandate requires Californians to reduce water use by 20%. Additionally, cities may now fine water-wasters, and some locales are promoting the implementation of drought-tolerant yards. Will this effort solve our water shortage woes? California manages about 40 million acre feet (13 trillion gallons) of freshwater a year, with urban use contributing to only around one-fifth of the total (about 9.1 million acre feet per year). A 20% reduction in urban yearly use will affect the total by about 1.8 million acre feet across the state. The Pacific Institute estimates that residential urban use could actually be made more efficient by a whopping 40-60%, and urban business and industries could improve by 30-60%. Still, if we were to enable a 60% reduction, it would only help by freeing up 5.5 million acre feet of the grand total. According to NASA, though, the state has a shortfall of almost 34 million acre feet of water. How—after we finish our praying and dancing for rain—can we possibly come up with the difference? We will have to produce it ourselves. I don’t mean that we are going to have to produce water de novo, like magic. This is all about the proper applications of science, through engineering, to convert unusable water into a fresh supply. There are two major areas of technology currently in development and begging for attention from innovators: desalination and water reclamation. Both involve the separation of freshwater from the things that make it unsuitable for human uses, such as salts, pollutants and human waste. Desalination is typically thought of as the refinement of saltwater by plants built in coastal areas, whereas reclamation deals with purifying water that was fouled by human or industrial use. The two main issues affecting their use and implementation are cost and environmental concerns. When it comes to desalination, those plants that are in existence use a well-established, yet fairly old process, called reverse osmosis, which forces water across a permeable filtration membrane. The lion’s share of the cost lies in the energy, usually supplied in the form of expensive electricity from the power grid, required to move the water across that membrane. Additionally, membranes get dirty, require cleaning with chemicals, and need replacing on a regular basis, which adds substantially to the cost of running the plants. Then there is the salty, chemical-filled brine after-product of desalination to consider. Where does it go? Often it is pumped right back into the coastal ecosystem—where it can increase local salt concentrations far beyond the normal range—but there are other brine disposal options available that depend on specifics of a plant’s location. Regulations are also in place to ascertain that any proposed desalination plant properly assesses effects on marine life and the environment. In California’s more recent history, investment in desalination plants has faced an uphill battle resulting from generally low water costs compared to the cost of water provided by such a facility, periodic booms in water supply, and legitimate concerns over environmental impacts. Now that water costs are now skyrocketing in many parts of the state, and scientists are predicting a mega-drought that could last 50 years or more, improved desalination technology is once again a hot topic. All of these factors could influence politicians and investors to favor desalination in the short-term. Donnelly went on to explain that farmers pay $100-200 per acre foot whereas urban areas are charged upwards of $1000-2000 for the same amount of water. She emphasized that residential districts sometimes act out of a sense of fear and urgency during droughts when they would benefit more from focusing on conservation and metering. They sign long-term contracts with desalination providers that lock them into paying for the capital costs of water that they no longer need when it starts raining again. There are examples of desalination plants being built during droughts only to be shuttered a few years later. The cost of desalination is currently around $2000 per acre foot, which is at the extreme high end of what people pay right now, but not completely unreasonable as water becomes more and more limited. Advancing technologies could lead to more efficient and affordable desalination processes, but at this point none are marketable or commercial. According to Ms. Donnelly, “Reverse osmosis is the industry standard, and best option.” Until technologies advance beyond the demonstration stage, they are as good as snake oil. One company, WaterFX, aims to provide commercial scale desalination of agricultural wastewater, and relies on something other than reverse osmosis. 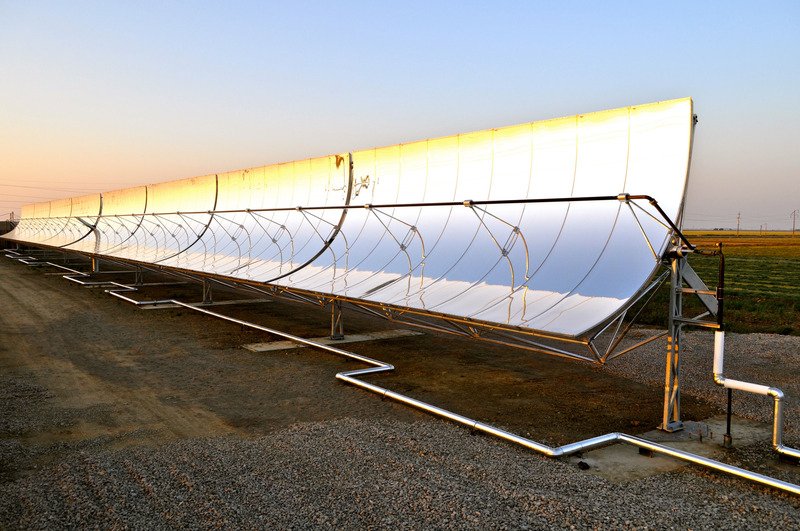 Their solar thermal distillation technology is a new twist on an old technique that elegantly brings desalination and water reclamation together. Using the heat from the sun, WaterFX has been able to increase the efficiency of what is essentially a concentrated solar still by implementing multiple-effect distillation, or MED. Dr. Matthew Stuber, co-founder and director of process systems engineering for WaterFX, told me that irrigation in areas with poor soil drainage leads to the accumulation of salts in the soil—potentially bad for crop yields. The solution, for many farmers, is to install drainage pipes underground that divert the water into evaporation ponds. It works to keep the soils productive, but requires large areas of land to go fallow. These ponds are actually a big problem for farmers and water management departments because of the concentrated salt build-up that can occur. Based on results from their demonstration plant, Dr. Stuber says that they are able to isolate the salts through the distillation process into a concentrated form that can leave the environment, and be dealt with in other ways, including making gypsum. The process is able to reclaim 93% of the drainage water that enters the system as freshwater, while simultaneously producing the brine “co-product”. The company chairman, Aaron Mandell, estimates that with expected advances in their technology over the next five years, a two-square mile area of land will be sufficient to provide 100 million gallons of water a day at a price of just $450 per acre foot. That’s one-quarter of the price of standard desalination. And, this is just the beginning for HydroRevolution. It’s estimated that there is nearly one million acre feet of drainage water in California’s Central Valley. And, according to Dr. Stuber, WaterFX is looking at other locations for implementation. He described the challenges that island states in places like the Caribbean face with drought, rising seas, and diminishing fresh groundwater. As the stores are reduced, saltwater encroaches, resulting in more brackish drinking water. Another potential customer: data centers, which require large amounts of clean water in order to cool processors, and would benefit from efficient recycling. WaterFX also claims to support an open-source philosophy. They are actively looking for people to contribute to the research in this area, to iterate upon it, and to push development for higher efficiency systems forward even faster. It's a business model that might be hugely successful when viewed through the lens of our environment. In the United States, a concerted effort is mounting to push innovation in all areas of water technology. Two organizations, the Water Environment Federation (WEF) and the Water Environment Research Foundation (WERF) have created a program called LIFT, the Leaders Innovation Forum for Technology, which works to get water tech ideas from conception to commercialization. Along those lines, California created its Innovation Hub (iHub) initiative to get more technology to market across the state. Additionally, a challenge was initiated by the Alliance for Coastal Technologies and a coalition of 10 government agencies, non-profits, and universities to develop a low-cost, accurate, and easy-to-use water nutrient sensor: nitrate and phosphate pollution are a $2 Billion problem for freshwater management. The business environment seems ripe for new ideas to increase efficiency and reduce water-related costs. Even if amazing technologies are developed, though, getting them adopted by water agencies is another problem entirely. I’d love to say that there's going to be a technological silver bullet for water. But water is complicated. WaterFX and other developing technologies for sensors, forward osmosis and nanotube membranes could be an integral part of a much bigger water strategy, but none show a clear path out of the dry woods. It’s going to take a lot of money. It’s going to take cooperation on a scale the west has never seen. Last year, California was one of several states to introduce right to repair legislation that would force companies to end practices that discourage the independent repair sector, creating a requirement to sell replacement parts, provide documentation, and supply codes to bypass DRM systems that locked new parts out of devices until the company activated them. Well, that didn't take long: after seven days on strike, the Oakland teacher's union has received an offer that they say capitulates on every major point at issue in the strike, including the stealth privatization of Oakland schools through vouchers and charter schools.